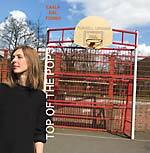 Carla Dal Forno offers Top Of The Pops, a self-released cassette disclosing six songs of sultry pop devotion. 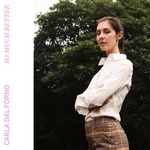 This late-spring cassette of cover songs now gets the wider autumnal release it deserves, showcasing the full range of Dal Forno's virtuous taste, style and production in her distinct post-punk, pop (but) minimalist sensibility. Not without cheek, the wink-and-a-nod blue-film bawdiness of "Lay Me Down" (Renee) and "Give Me Back My Man" (The B-52s) are complemented by the earnest ballads of "A Silver Key Can Open A Lock Somewhere" (Liliput) and The Fates's "No Romance." Kiwi Animal's "Blue Morning" finally gets a recorded release as well. This cosmic inner dialogue of love lost is matched only by the penultimate track, "Summertime Sadness" which is the best example of how devastatingly personal a pop song truly can be. It's all emphasized by Dal Forno's sparse production which, as with each of these six songs, brings her vocal interpretations to the fore. Pearl blue cassette wrapped in color-printed J-cards and with color sticker inlays. Artwork designed by Carla Dal Forno.